I would not be writing this review if it wasn’t firstly for my crazy boyfriend and his generosity and, to Cotswold Cycles for helping him track down this beauty of a bike! This was our first Christmas together and in the morning Phil and I opened our presents. I thought I had done quite well with a surprise trip to Prauge to watch Robbie Williams in concert (his dream). But of course he went one better, I opened an envelope which had a picture of the Trek Fuel EX 9.7, to say I was shocked was an understatement- I just cried with happiness. He had spent all week trying to sort out the bike and Cotswold Cycles were amazing, going above and beyond to help Phil out. I managed to get out on the EX for a few rides over Longleat trails and I was immediately impressed. The reason I am only just writing this review is because I feel it is only recently I have experienced the bikes potential. Wind Hill Bike Park opened in Longleat last week, this is only a 10 min ride from my parents house and I could not wait to get over there. Luckily my technical skills have improved over the past year to allow this bike to be ridden down runs that actually challenge it slightly. Frame = OCLV Mountain Carbon main frame, alloy stays, ABP, Boost 148, Knock Block steerer stop, Full Floater, EVO link, E2 tapered head tube, Mino Link, Control Freak internal routing, Carbon Armor, PF92, ISCG 05, G2 Geometry. Wheels = Bontrager Duster Elite, Boost 148/110. 29? (I have only ever ridden 29? so is always my preference). Front suspension = Fox Rhythm 34 Float with 130 mm travel. Rear suspension =Fox Performance Float EVOL with 130 mm travel. Personally I think Trek have nailed their goals for this bike, setting out to design a bike that gave more capability for those XC racers whilst accommodating the competitive weight for those Enduro riders. With 130 mm travel front and rear this bike has got a lot of capability- probably more than I can give it at the moment (working on this). The bike comes with three compression settings on the Fox Float EVOL shock feel plusher. This is a great feature of the bike as it has allowed me to use it on a number of training sessions and, although many people wouldn’t spend much time in the full lock-out, I can tell you on a number of fire roads you wouldn’t think you were riding a 130mm travel bike. Over normal XC trails I have been running the middle setting but more recently I have opted for full float- oh how comfy !! Only recently have I experienced the capability this bike has on drops. A few people may get offended by this but as a ‘girl’ throwing the bike around can be a little more challenging but as this bike is light weight it carries speed down descents well without feeling ‘heavy’. 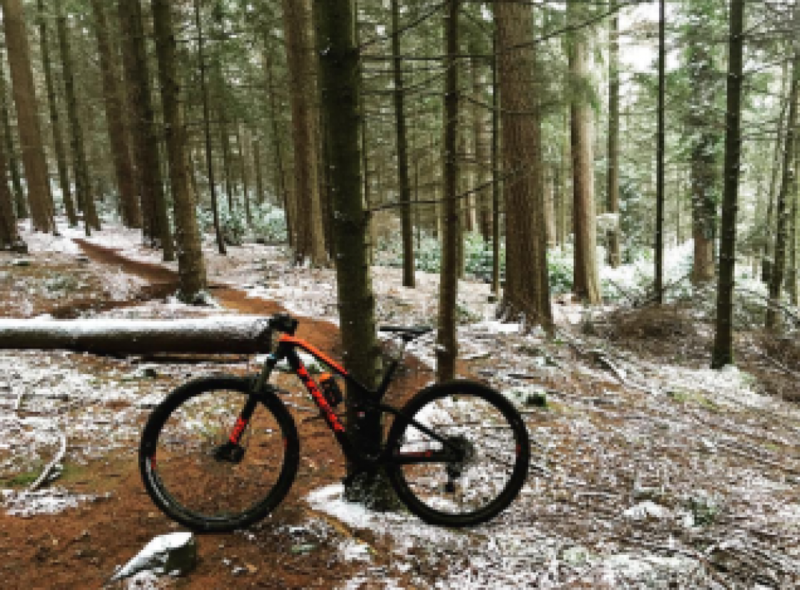 I have tested the bike on some decent height drop offs and jumps and have found the EX to ride so smoothly and softly which eliminates any heavy impact landings that are often experienced with your normal 100mm travel XC bike. I have only ever ridden 29? wheels and the EX 29? proved to show what they are designed for. Riding the roots sections on the descents, the bigger wheels seem to eat up the roots better and, for me it encourages me to ride off the brakes which ultimately resulted in smoother and faster runs. Cornering is something I have always been trying to improve and I found I was riding corners on EX with real confidence (very pleasing for me) as the bigger tyres rolled really quick into corners and allowed me to slide into corners smoothly . When you are used a super light Top Fuel 9.9 climbing a steep push up on a trail bike can be a little more demanding on the legs. In having said that the bike climbs pretty quick and the bigger tyres gain good traction to keep a consistent speed.